I have been wanting to try making my own Challah for a while now (like, a couple of years). My excuse: I just have an overwhelmingly long list of things that I would like to try someday, although my Bucket List here may not reflect it. One of my motivations for making Challah is they are wonderful bread for French Toast. I finally decided to take the plunge and give this bread a try. One of my friends, Sena, a great baker — often makes this bread; and I asked her if she had any tips for making my first Challah. She graciously offered up her recipe; and I was doing the happy dance at work (thankfully, my co-workers are very tolerant). I knew that her recipe would work, because she makes this bread often. I had initially planned to take the steps by steps picture of the braid, but (sigh…), just like I always do… I ended up starting this bread at 8 o’clock at night; and probably didn’t finish until after midnight because my kitchen was a little bit drafty, and the dough took longer to rise. The cold winter outdoor really provided a cozy backdrop of my warm baking adventure in the kitchen, but not too great with my energy level. Therefore I only ended up with a final picture. I hope you enjoy this recipe – and would give it a try. I enjoyed this bread toasted with jam and Red enjoyed his with peanut butter. Charlotte enjoyed a couple of ends pieces as well. Everyone in the family was happy and satisfied with this bread. Finally, I also made a fantastic new stuffed French Toast recipe with the leftover that I would post in the near future. Many thanks for Sena for sharing the recipe; and letting me share this with the rest of the world through the blog. Happy eating & baking! Put all of the ingredients together in a stand mixer bowl, fitted with a dough hook. Mix on low for approximately 8-10 minutes until the dough is smooth and stiff with a slight sheen. Turn the dough out on a lightly floured work surface and knead gently for 2-3 times. Fold the bottom third up and top third down, fold left and right sides in, and turn the seams’ sides down into a lightly oiled mixing bowl. Cover with lightly oil plastic wrap for approximately one hour or until it is doubled in size. Punch dough down; divide dough into three equal pieces and roll them into cylinder approximately 18-inches long. Braid the three cylinders together. 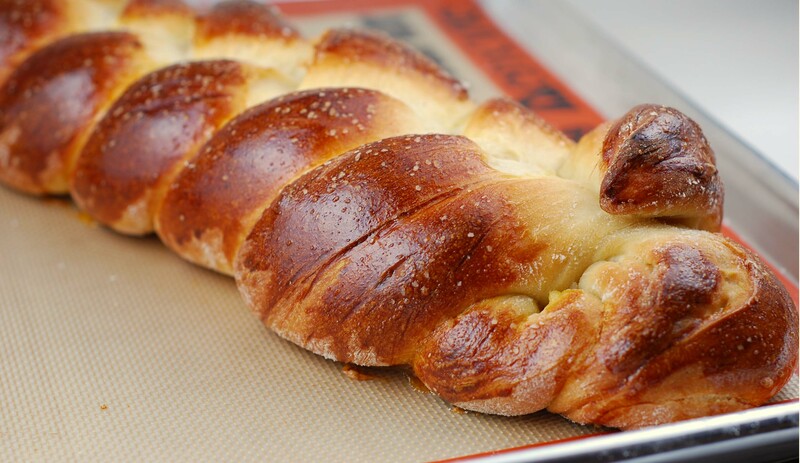 Move braided Challah carefully onto a lined baking sheet. Let rise for 30 to 45 minutes in a warm area. Make a glaze of egg yolk and 1 teaspoon water. Brush over bread and sprinkle with kosher salt or sesame seeds. Bake at 375 for 27 minutes. This entry was posted on Tuesday, January 18th, 2011 at 12:00 am and is filed under bread, breakfast. You can follow any responses to this entry through the RSS 2.0 feed. You can leave a response, or trackback from your own site.